WAYNESVILLE, Ga. – Tyler Erb, in his debut as driver of the Best Performance Motorsports No. 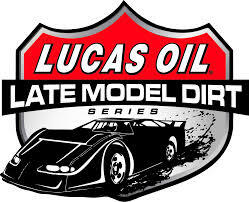 1, made his way to victory lane in the Lucas Oil Late Model Dirt Series season opener Saturday at Golden Isles Speedway. 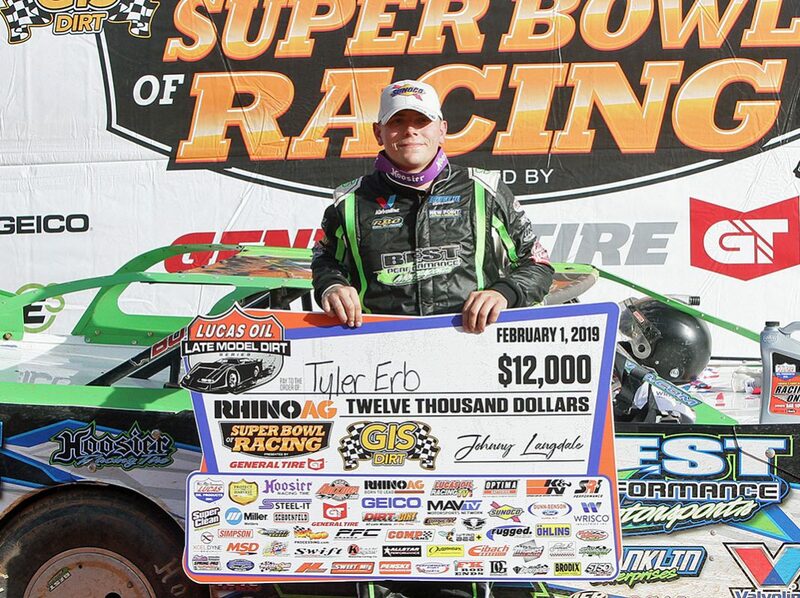 Erb took the lead from Hudson O’Neal on lap 13 and held the point to claim the Rhino Ag Super Bowl of Racing presented by General Tire opener. Earl Pearson Jr. tried to track down Erb in the final 10 laps of the race, but settled for second in the Lucas Oil Products, Clements-powered, Black Diamond Chassis for Ronnie and Terri Stuckey. 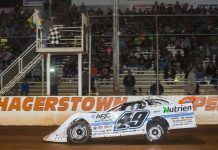 Jonathan Davenport was third in the Nutrien Ag Solutions, Longhorn for Lance Landers Motorsports. O’Neal, who set a new track record in qualifying on Friday night, started from the pole and led the first 12 laps of the race. O’Neal held the point until he slipped a bit in turn two allowing three drivers to get by him. O’Neal recovered and made his way back to second until he got into the turn one wall, ending his race on lap 27. Erb then set a steady pace for the remainder of the final 23 laps. Erb encountered lap traffic with 10 laps to go. Pearson cut Erb’s nearly three second lead down to just five-car lengths at the checkered flag. Pearson, gave the winner his best shot at the end, but ran out of laps. Davenport, the two-time and defending series champion, said he should have gone to the top earlier in the race. Tyler Erb, Earl Pearson Jr., Jonathan Davenport, Josh Richards, Brandon Sheppard, Don O’Neal, Scott Bloomquist, Devin Moran, Chase Junghans, Dennis Erb Jr., Kyle Bronson, Tim McCreadie, Jimmy Owens, Brandon Overton, Devin Gilpin, Matt Cosner, Jason Jameson, Hudson O’Neal, Brian Shirley, Ryan King, Shanon Buckingham, Stormy Scott, Chris Ferguson, Gregg Satterlee.